Leona Keller married Charles Arthur Wingo. This is his family line. JAMES WILLIAM WINGO was born 1719 in Amelia County, Virginia. Died 1792 in King William County, Virginia. i. JOHN WILLIAM WINGO, born 1754 in Amelia County, Virginia. ; died November 1815 in Russell County, Virginia. JOHN WILLIAM WINGO (JAMES), born 1754 in Amelia County, Virginia. ; died November 1815 in Russell County, Virginia. Married MARY, born 1747 in Amelia County, Virginia; died before 1815 in Russell County, Virginia. i. JAMES WINGO, born 1770 in Virginia. ii. WILIAM ESQUIRE WINGO, born 1772 in Virginia. WILLIAM ESQUIRE WINGO (JOHN, JAMES) was born 1772 in Blue Ridge Mountains, Virginia, and died Abt. 1846 in Tazewell County, Virginia. He married MARY ELIZABETH MCGUIRE June 18, 1802 in Tazewell County, Virginia, daughter of WILLIAM MCGUIRE. She was born Abt. 1780 in Maiden Spring Fork, Tazewell County, Virginia, and died January 11, 1856 in Maiden Spring Fork, Tazewell County, Virginia. i. SERRILDA JANE WINGO, b. 1803; m. MOSES PRUITT, July 21, 1829, Tazewell County, Virginia; b. 1798; d. 1890.
ii. WILLIAM ESQUIRE WINGO, b. Abt. 1804, Virginia; d. February 14, 1873, Tazewell County, Virginia; m. MARY SHIPLEY, April 09, 1829, Tazewell County, Virginia; b. Abt. 1812; d. 1893.
iii. LAVINA WINGO, b. Abt. 1814, Tazewell County, Virginia; d. May 22, 1857, Tazewell County, Virginia. iv. RACHEL WINGO, b. Abt. 1816; m. WILLIAM MCGUIRE, January 04, 1836, Tazewell County, Virginia; b. 1812.
v. ELIZABETH WINGO, b. Abt. 1817; d. Aft. 1850; m. HUGH A. CRUMPTON, September 29, 1837, Tazewell County, Virginia; b. Abt. 1818; d. Aft. 1850.
vi. JOHN WINGO, b. January 13, 1820, Tazewell County, Virginia; d. January 13, 1892, Platte County, Missouri. vii. JAMES M. WINGO, b. Abt. 1821, Tazewell County, Virginia; d. May 23, 1855, Tazewell County, Virginia. viii. V. LYDIA WINGO, b. November 1824; d. Abt. 1900.
ix. MARY WINGO, b. Abt. 1826, Virginia; m. JOHN T. SAYERS, September 03, 1846, Tazewell County, Virginia; b. Abt. 1826.
i. ANDERSON FRENCH WINGO, b. March 1834, Tazewell County, Virginia; d. Abt. December 1905, Tazewell County, Virginia. ii. ROBERT SQUIRE WINGO was born February 15, 1838 in Richlands,Tazewell Co.,VA. Died December 22, 1889 in Tazewell Co.,VA. Married MARY MRGARET MCNEIL January 23, 1866 in Tazewell Co.,VA. iii. MARY WINGO was born in 1843 in VA.
iv. AMERICA WINGO was born in 1847 in VA.
JOHN WINGO (WILLIAM, JOHN, JAMES) was born January 13, 1820 in Tazewell County, Virginia, and died January 13, 1892 in Platte County, Missouri. He married MELISSA JACKS July 24, 1842 in Platte County, Missouri. She was born August 08, 1822 in Clay County, Missouri, and died January 30, 1896 in Platte County, Missorui. John Wingo moved to Platte County, Missouri in 1837, being one of the earliest settlers in that area. i. WILLIAM P. WINGO, b. 1843.
ii. MARTHA FRANCIS WINGO, b. 1845; m. G. W. MILLER, Platte County, Missouri. iii. JAMES H. WINGO, b. November 06, 1848; m. ELIZABETH JANE DUNCAN, December 23, 1874, Platte County, Missouri. iv. GEORGE WASHINGTON WINGO, b. November 26, 1850, Platte County, Missouri; d. 1903, Whitefield, Choctaw Nation, Indian Territory. v. BENJAMIN L. WINGO, b. January 12, 1852; m. IDA BROWN, Platte County, Missouri. vi. MARY ELIZABETH WINGO, b. March 03, 1855; m. JOSEPH J. SOPER, January 29, 1879, Platte County, Missouri. vii. ELIAS FRANK WINGO, b. 1857; m. SUSAN M. DUNCAN, September 04, 1878, Platte County, Missouri. viii. SARAH WINGO, b. 1859; m. SAMUEL P. MARTIN, September 09, 1882, Platte County, Missouri. ix. AMERICA J. WINGO, b. January 18, 1861; m. O. HOLLAND, Platte County, Missouri. x. JOHN LEE WINGO, b. April 12, 1863; m. CATHERINE A. ENDICOTT, Platte County, Missouri. xi. SIDNEY WINGO, b. November 26, 1865; m. ANNIE L. DAVIS, 1887, Platte County, Missouri. 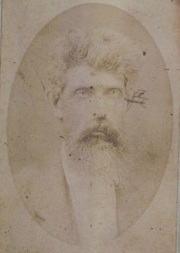 ANDERSON FRENCH WINGO (LAVINA, WILLIAM, JOHN, JAMES) was born March 1834 in Tazewell County, Virginia, and died Abt. December 1905 in Tazewell County, Virginia. He married (1) MARY A. YOUNG March 02, 1865 in Tazewell County, Virginia. He married (2) KANSAS LOUISE YOUNG June 24, 1880 in Tazewell County, Virginia. She was born May 30, 1857 in Greenup County, Kentucky, and died January 08, 1937.
i. HENRY ROBERT STANLEY WINGO, b. June 16, 1873, Tazewell County, Virginia; d. June 27, 1979; m. VIRGINIA BELLE LOCKHART, December 16, 1910, Tazewell County, Virginia; b. September 25, 1893, Richlands, Tazewell County, Virginia; d. April 05, 1976, Roanoke, Independent County, Virginia. ii. LELAND EDGAR WINGO, b. May 22, 1876, Tazewell County, Virginia; d. July 19, 1937, Kanawha County, West Virginia; m. SARAH ANN BELTON, December 24, 1896, Tazewell County, Virginia; b. August 22, 1877, Tazewell County, Virginia; d. July 18, 1957, Kanawha County, West Virginia. GEORGE WASHINGTON WINGO (JOHN, WILLIAM, JOHN, JAMES) was born November 26, 1850 in Prairie Point, Platte County, Missouri, and died 1903 in Whitefield, Choctaw Nation, Indian Territory. He married MARY JANE TURLEY August 20, 1871 in Newton County, Missouri, daughter of WILLIAM TURLEY and ELIZABETH DESHANE. She was born April 1855 in Sherman, Texas, and died 1932 in Grant, Oklahoma. As the Civil War grew near, Platte County, Missouri being a border county, became a bloody no man's land being controlled by neither North or South through most of the War. Most of the families in this area suffered heavily from raids by Missouri Red Legs, Union Soldiers and Jayhawkers. As a result of the bloody northern raids, citizens in Platte and Clay Counties formed secret bands of Partisan Guerrillas to protect their homes and families and disrupt northern supply lines in this area. The Wingos took up arms with guerrila bands out of Clay County under elements of William Quantrell and Coone Hayes operating under the orders of General Price of the Missouri State Guard. George, being a young lad, rode with his older brothers on raids out of Liberty, Clay County, Missouri with their distant cousins the Younger's. George was too young for combat but mainly held the horses for the older men on raiding parties and carried messages. Even though the War ended in 1865, it continued on for many years in the Missouri area through guerrila raids. The conflict continued because the partisan guerrilas were not recognized as Confederate troops and were not offered paroles by the Union forces after the war. The guerrilas were treated as outlaws and were shot or hung upon their capture. George continued to participate in guerrila raids into the late 1860's until he was forced to leave northern Missouri due to pressure from Union troops and lawmen. He escaped capture by going into the Ozark Mountains where he jioned a Missouri band of Shawnee Indians near Seneca, Missouri. 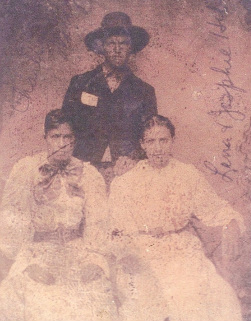 The Wingo, Turley and DeShane families moved from Missouri to Arkansas, then to the Indian Nations between 1878 and 1884. They settled near Whitefield, San Bois County, Choctaw Nation joining other ex-Confederate guerrilla families along the Canadian River. i. EDDIE WINGO, d. Indian Territory, Oklahoma. Died at age 15 in a fire. iii. BENJAMIN FRANKLIN WINGO, b. October 1872, Newton County, Missouri; d. Grubbs, Jackson County, Arkansas; m. (1) JANE LAMB; m. (2) ARTIE KELLER; b. January 08, 1884, Parke County, Indiana; d. November 23, 1951, Tuckerman, Arkansas. Artie Keller was blind. iv. JAMES L. WINGO, b. August 05, 1875, Missouri; d. Abt. 1954, Grant, Choctaw County, Oklahoma; m. AMANDA SHEHAN, Oklahoma; b. 1864, Illinois. v. MINNIE WINGO, b. May 20, 1880, Arkansas; d. November 1970, Arkansas; m. JAMES THORNBURG, Oklahoma. vii. MOLLIE WINGO, b. April 30, 1884, Indian Territory, Oklahoma; d. April 30, 1963, Oklahoma; m. BOB LANCASTER. ix. JOHN MCCLELLAN WINGO, b. January 04, 1888, Whitefield, Choctaw Nation, Indian Territory; d. July 04, 1964, Roff, Oklahoma. Married REBECCA ANN SELLERS, September 27, 1908; d. February 26, 1961, Durant, Oklahoma. BENJAMIN FRANKLIN WINGO (GEORGE, JOHN, WILLIAM, JOHN, JAMES) b. October 1872, Newton County, Missouri; d. February 14, 1944 in Grubbs, Jackson County, Arkansas; m. (1) LISA JANE LAMB; born 1872 in Arkansasm. (2) ARTIE KELLER., daughter of JACOB KELLER and LUEANNA GREEN. ; b. January 08, 1884, Parke County, Indiana; d. November 23, 1951, Tuckerman, Arkansas. Artie Keller was blind. BENJAMIN WINGO burial: Denton Island Cemetery, Tuckerman, Arkansas. vii. JACK WINGO, b. May 17, 1923, d. April 24, 2004 in Arkansas. Married HELEN MYERS December 25, 1945, daughter of JAMES MYERS and ANNIE GIFFORD. She was born November 20, 1929. CHARLES ARTHUR WINGO (GEORGE, JOHN, WILLIAM, JOHN, JAMES) was born August 1881 in Newton County, Arkansas, and died 1907 in Francis, Pontotoc County, Oklahoma. He married LEONA KELLER November 15, 1901 in Fort Gibson, Indian Territory, Telaquia County, Oklahoma, daughter of JACOB KELLER and LUEANNA GREEN. She was born September 27, 1887 in Illinois, and died 1952 in Tuckerman, Jackson County, Arkansas. ii. ROSIE MAE WINGO, b. July 23, 1905, Ada, Pontotoc County, Oklahoma; d. August 14, 1987, Palestine, Poinsett County, Arkansas. Married (1) ALEX BRECHEEN, married (2) BENJAMIN MCCOY. OSCAR EUGENE WINGO (GEORGE, JOHN, WILLIAM, JOHN, JAMES) born April 23, 1886 near Tahlequah, Cherokee Nation (Oklahoma). m. BERTHA SELLERS, October 12, 1917 at Stonewall, Pontotoc County, Oklahoma. Oscar and Bertha separated with Bertha taking the children with her to Texas. Bertha remarried to Clois Steel and died a short time therafter of cancer. Oscar went to Texas and reclaimed his children and brought them back to the Hugo, Oklahoma area. Oscar remarried MARY ELIZABETH REED on August 24, 1935 at Hugo, Oklahoma. In the early 1940's Oscar moved his family to California and settled at Waterford. Oscar was a farmer most of his life and always has a close relationship with his brother John McClellan Wingo for many years. Mary Elizabeth Wingo died on September 2, 1961 and Oscar Eugene Wingo died on February 14, 1969 with both being buried at the Lakewood Memorial Park Cemetery at Empire, California. JOHN MCCLELLAN WINGO (GEORGE, JOHN, WILLIAM, JOHN, JAMES) was born January 04, 1888 in Whitefield, Choctaw Nation, Indian Territory, and died July 04, 1964 in Roff, Oklahoma. He married REBECCA ANN SELLERS September 27, 1908 in Happyland School house near Oakman, Pontotoc County, Oklahoma. She was born January 23, 1892 in Terrell, Kaufman County, Texas, and died February 26, 1961 in Durant, Oklahoma. John and his family moved to the Bruno Mayer ranch in what is now Hughes County in 1903, shortly after his father's death near Whitefield. He was a farmer all his life. iii. ELLEN WINGO, b. March 08, 1914, Oklahoma; d. January 31, 2002; m. (1) OTT SCROGGINS; m. (2) JOHN BLAKLEY. v. CLAUDE WASHINGTON WINGO, b. June 06, 1918; m. CLEORIA TUCKER. vi. EULA MAE WINGO, b. July 25, 1920; m. HORACE FITE. vii. WILLIE LEE WINGO, b. March 1922. Died as a child of cholera. ix. ROBERT LEROY WINGO, b. April 20, 1927; m. (1) EVA SCHLECHT; m. (2) DOROTHY COULSTON. x. REBA FAY WINGO, b. October 31, 1929; d. December 25, 1992; m. JIM WIEGAND. xi. CHAMP MCCLELLAN WINGO, b. January 25, 1932; m. JO ANN KING. xii. GLEN RAY WINGO, b. January 31, 1934; m. (1) LINDA HALL; m. (2) DIXIE BEAVER; m. (3) LEA ANN HERRELL. COLUMBUS RUPHERT WINGO (CHARLES, GEORGE, JOHN, WILLIAM, JOHN, JAMES ) was born January 30, 1902 in Ada, Pontotoc County, Oklahoma, and died March 25, 1970 in Grubbs, Jackson County, Arkansas. He married WILLIE MAE FERGEISON September 28, 1923. She was born August 04, 1906, and died June 03, 1984 in Jackson County, Arkansas. iv. GRACIE LEE VIOLA WINGO, b. 1933, died April 30, 2002 in Newport, Arkansas. Mrs. Gracey Lee Viola Wingo Easley, 69 of Grubbs, died Tuesday, April 30, 2002 at Newport Hospital. She was a retired nurse and member of Faith Missionary Baptist Church where she taught the women's class. She was preceded in death by her parents, Columbus Rupert Wingo and Willie Ferguson Wingo, and one daughter, Vickie Anita. 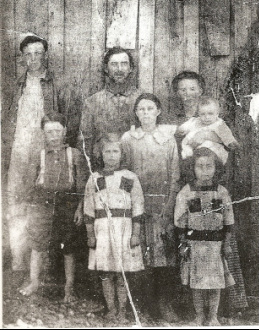 Mrs. Easley is survived by her first husband, Bill Easley of Fouke; three sons, Ray Easley of Fouke, Roy Easley of Cord, and Karry Easley of McNeil; one daughter, Kathy Newton of Grubbs; three brothers, Bob Wingo of Tuckerman, Troy Wingo of Albuquerque, New Mexico, and Billy Wingo of Tyler, Texas; three sisters, Juanita Easley of Grubbs, Wanda Hastings of Jonesboro, and Linda Gakewski of Shreveport, La. ; eight grandchildren, and nine great-grandchildren. Funeral service was 2 p.m. Thursday at Faith Missionary Baptist Church in Newport. Interment was in Ballews Chapel Cemetery in Grubbs. Arrangements by Dillinger Funeral Home. ROSIE MAE WINGO (CHARLES, GEORGE, JOHN, WILLIAM, JOHN, JAMES) was born July 23, 1905 in Ada, Pontotoc County, Oklahoma, and died August 14, 1987 in Palestine, Poinsett County, Arkansas. She married (1) ALEXANDER F. BRECHEEN. He was born June 03, 1893, and died November 24, 1984. Military service: Cpl. U.S. Army World War I. She married (2) BENJAMIN MCCOY March 09, 1921. ROSIE MAE WINGO and ALEXANDER F. BRECHEEN: Burial: Holly Springs Cemetery, Harrisburg, Bolivar Township, Poinsett County, Arkansas. MARY LOU WINGO (CHARLES, GEORGE, JOHN, WILLIAM, JOHN, JAMES) was born April 01, 1908 in Francis, Pontotoc County, Oklahoma, and died October 30, 1949 in Newport, Jackson County, Arkansas. She married WILLIAM ISAAC BALL June 23, 1922 in Jackson County, Arkansas. Mr. Luther "Luke" Furgeison, 82, of Tuckerman departed this life Thursday, December 15, 2011. Mr. Furgeison was a farmer and enjoyed fishing, hunting, and sitting under a shade tree. He was preceded in death by his parents, Bud and Minnie (Wingo) Furgeison; brothers, Owen Furgeison, infant, Buddy Furgeison; sisters, LaNora Malone, Lucille Tunstall, Alta Furgeison, and Alice Bierbaum. His survivors are two brothers, Calvin Furgeison of Oil City, Louisiana, Earnest Furgeison of Oil City, Louisiana; two sisters, Ann Kious of Bono, Betty Winchester of Tuckerman.Graveside service will be 2:00 p.m. Saturday, December 17, 2011 at Ballews Chapel. Visitation will be 12:30-1:30 p.m. Saturday, December 17, 2011 at Dillinger Funeral Home.